When the Howards got engaged in 2010, they couldn’t decide what bucket-list destination they would check off for their honeymoon. So they hatched a plan to take on many of their top picks: Hike Machu Picchu, scuba dive the Great Barrier Reef, go on safari in the Maasai Mara and explore Angkor Wat, Anne Howard says. But the list just kept getting longer. “As soon as we got engaged, we started planning this around-the-world honeymoon,” says Mike, who keeps a spreadsheet of every flight they have taken, including miles flown, cost of the flight in both cash and miles, booking fees and value per mile on redemptions. They were originally planning to celebrate their nuptials by traveling for a year, but once they got involved in the mileage game, they realized flights weren’t going to be a big expense. “Less than a year after we started collecting miles we had earned 430,000,” Mike says. And now, the couple might be on the world’s longest honeymoon. After almost 110 flights, Anne and Mike have made travel their life. But the best part is that they’ve used points and miles for 70% of the flights, saving them over $33,000. They focused on credit card sign-up bonuses, spending opportunities and bonus category spending for their personal and business expenses. They earned a few miles actually flying, but the bulk of it was through credit cards. They kicked off their honeymoon on Jan. 22, 2012, with a one-way flight from New York to Manaus, Brazil. That first leg of what would become a very long journey cost them 30,000 points and $6.85 each to fly Copa Airlines. After exploring Brazil, Argentina, Chile, Bolivia and Peru, they flew to Johannesburg for 40,000 miles each on United Airlines. They spent three months in Africa, exploring seven countries before flying to their next continent, Asia. The couple, and a cheetah, posing in Kenya in August 2012. The flight from Nairobi, Kenya, to Kathmandu, Nepal, cost 30,000 miles, and they booked this ticket on points four days before departure when the cash price of a ticket was over $1,200, Mike explains. Their Asia itinerary included flights to Hong Kong; Kunming, China; Tokyo; Bangkok; and Yangon, Myanmar. Next up, New Zealand. And this was still 2013. The United Airlines flight from Thailand to New Zealand would have cost $620 each, but the pair got there for only 17,000 miles and $36 in fees, in one of their best redemptions to date. They stayed for a month in New Zealand before taking off for Australia and then the Philippines and Indonesia. From there they flew through the States before continuing on to Scotland, England, Ireland, Norway and Turkey. All told, they visited 33 countries in the first two years of their now seven-year journey. No, they’re not millionaires or flight attendants. They’ve spent less than $7,000 on the 33 flights they paid for. The other 76 flights were paid for with some 1.9 million miles they collected over the years. They have booked flights using a variety of programs and platforms over the past seven years. Lately, their favorite redemptions are using Chase Ultimate Rewards® through the Chase portal. Their favorite card is the popular Chase Sapphire Reserve®. “Our favorite carrier?” Anne says, “Hands down, Southwest Airlines!” The Companion Pass and no-blackout dates made for easy and cheap bookings while exploring North America and the Caribbean over the past year. They’ve had the companion pass every year since 2014 by taking turns earning it and designating each other as a companion. “It’s one of the benefits of flying as a couple,” Anne says. And those Chase Ultimate Rewards® points transfer to Southwest if they want to use them to grab two award tickets for the price of one. They currently have 165,000 Southwest points so it won’t need a top-off anytime soon. The fact that Southwest flies to Belize was part of their inspiration for taking a three-month housesitting and backpacking trip around Central America this past fall. The sharing and gig economies have definitely helped fuel this lifestyle. The couple housesits to keep expenses down and they use their writing, photography, marketing and social media skills in partnership with publishers and tourism boards around the world. Anne and Mike Howard in North Cascades National Park in Washington in July 2018. They recently launched HoneyTrek Trips to execute custom itineraries in far-flung places for others looking to travel like them. They’ve compiled their favorite destinations into National Geographic’s “Ultimate Journeys for Two,” and they have a second book coming out in the fall. 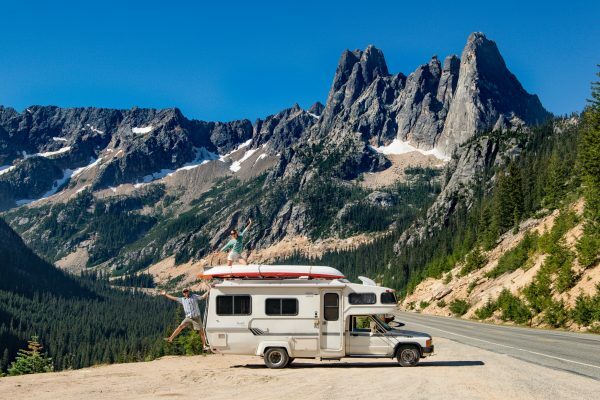 To research their next book, about the best destinations for glamping (“glamorous camping”) in North America and explore little-known corners of the continent, they bought a 1985 Toyota Sunrader RV. Since April 2017, they’ve traveled to 45 states from Florida to Alaska, as well as four Canadian provinces. They are working their way back to the city where they met, New York, in early 2019. But don’t expect them to stay put too long. They still have Central Asia and Eastern Europe on their radar this year. Some of their best experiences, Anne says, have been exploring the little-known places between the airports they landed in. “Don’t get too focused on checking things off a bucket list,” she advises. “Getting off the beaten track and meeting the locals can rival the wonders of the world.” Their journey has been filled with life experiences and learning opportunities along the way. They also love gifting their miles. Mike’s recently married brother and sister-in-law weren’t sure where they would go on their honeymoon, so Mike and Anne gave them an unlimited points budget to fly anywhere Southwest Airlines flies. Maybe the travel bug will bite them, too. Photos courtesy of Anne and Mike Howard. Is the Platinum Card From American Express Worth Its Annual Fee?